The use of HCG with TRT has been around for a long time but still has not made it into the mainstream yet. It is widely used by TRT clinics, anti-aging doctors and fertility specialists, but will probably be a few more years for widespread adoption. I believe it will eventually happen, though, for the reasons I outline below. Ouch! Why was my LH so low? Standard TRT, especially if you boost testosterone significantly, will raise testosterone and estradiol levels and the hypothalamus will begin shutting down the signaling to the pituitary. This "shut down" is just one of the consequences of TRT, and it's long term impact is poorly understood. And, yes, LH will tend to go down to dang near zero. Because I had never had LH pulled before, the consequences of such low LH started to bother me. Was it really good to have that low of a serum LH? Sure, my testosterone levels were beefy from TRT (650-800 ng/dl) from testosterone therapy - I feel very good on TRT by the way - but does youthful testosterone really compensate for abyssmally low LH levels in the long term? I don't believe it will, because the LH receptor is present and clearly biologically active (though poorly understood) in many key tissues, such as the hippocampus, adrenal glands and arteries. You can read more about that on my page on The LH Receptor in Men. The good news is that someone got the creative idea to try HCG to compensate for this issue, because HCG is a hormone very similar in structure to LH and actually binds to the LH receptor. And Mother Nature probably put 'those receptor there for a reason, eh? 2. Boost Libido. A well done TRT program will generally boost libido in men, and, in fact, studies have shown the effect to be dose dependent on average. See my page on Testosterone and Libido for more information. However, there is a signifcant block of men who do not enjoy that benefit and HCG can help some of them. HCG can also increase alertness and energy as well. My former TRT clinic estimated the men that HCG significantly help at about a fourth of their patients. 3. Increase Testicular Size (Volume). Another consequence of a TRT program (that actually boosts testosterone) is shrunken testes. 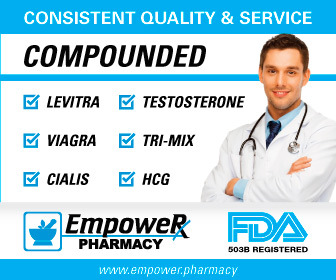 To be honest, I don't think most women care or notice as the effect is not that pronounced., something I cover in my page on Testosterone Therapy and Testicle Size. Nevertheless, the last thing most ex-low T guys need is to feel demoralized with small acorns adorning their tree - they've been through enough already! This is where low dose HCG can come in. By simply adding 250-500 IU of HCG twice per week, volume is generally restored within 3-4 weeks in men on TRT. NOTE: If you do go on HCG, make sure your physician pulls estradiol during follow up testing (with the right test). 4. Restoring Fertility. One of the big concerns for younger men on TRT is the fact that their fertility is greatly lowered. Yes, you can still conceive in some cases, but your odds are significantly lowered. Because HCG activates the testes by mimicking LH and attaching to LH receptors, men usually experience a big boost in fertility. One study showed that 500 IU several times per week was enough to restore fertility to youthful levels in men on testosterone, something I discuss in detail in my page on Testosterone and Fertility. 5. Protection from TRT Failure. Tying into #3 and #4 is the fact that HCG (generally) keeps the testes "alive." Although this has not been formally studied as far as I know, keeping the testes fully functional could potentially help preserve testosterone production if one has to go off of TRT. Granted, it's not common to be forced off of TRT, but it can happen if your PSA, hematocrit or blood pressure climb from testosterone therapy. In fact, it happened to me for a month, something you can read about it in my page on High PSA But No Cancer. And it has happened to other men on our forum. What happens when you go off of TRT is that you actually nosedive below your old baseline testosterone levels. In my case I was alway in the low 300's (ng/dl) before I went on TRT. A month after being forced off of TRT due to a high PSA, my testosterone was 121 ng/dl! If I had stayed off of TRT, I probably would have risen slowly in 2-3 months back to the low 300's. Or would I? There are rumors that older guys do not always snap back to their old levels after being on TRT for awhile. What if your testes have been shut down for 10 years and you have to stop? Would your testes ever fully recover? That's a good question that deserves some research. But, in the meantime, HCG is probably a good insurance policy against that situation, because basically your testes never get turned off if you are on HCG. CAUTION: I make the case that more is not better when it comes to HCG. It is a placental hormones that is long-lasting (compared to LH) and stimulates EGF and VEGF. See my page on Potential Dangers of Too Much HCG. Yes, progesterone can have feminizing traits and, yes, cortisol is associated with stress. But what is poorly understood is that a significant block of men are actually low in one or more of these hormones and feeling lousy because of it. HCG activates the enzyme that converts cholesterol to pregnenolone and thus can "backfill" the progesterone and cortisol pathways, raising levels of those key hormones in some men who are deficient. Now it certainly does not always work out that way, but this certainly does happen and may explain why some men feel substantially better on low dose HCG accompanying their TRT.